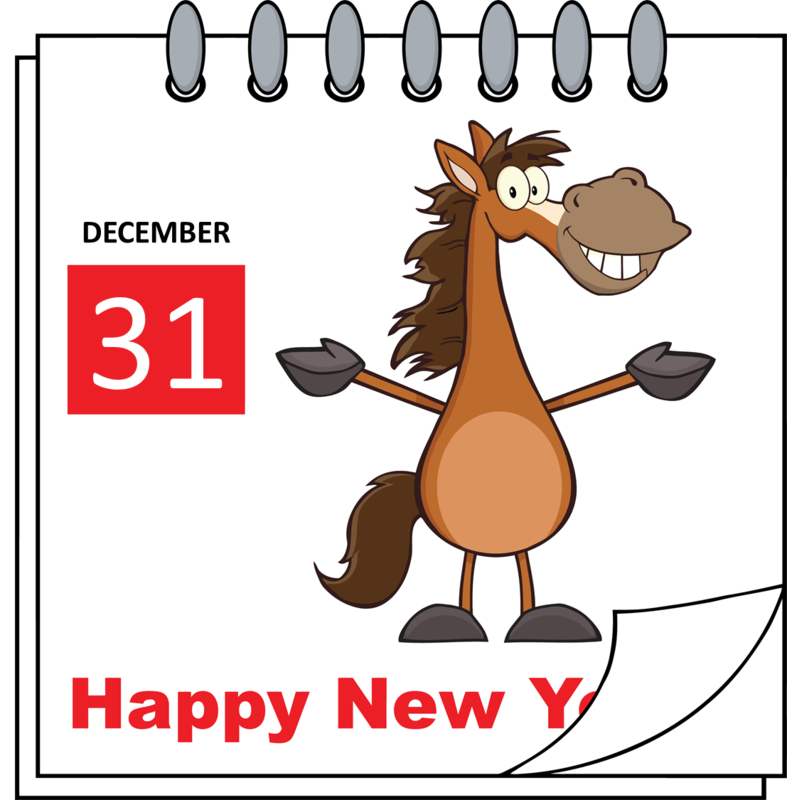 There are example ESL New Year conversations on this page that you can use to help you understand how to use New Year vocabulary when talking. By looking and thinking about the conversations on this page you will be able to prepare for when you need to talk to someone. The first part of this page has two example conversations that you can read and use as templates for when you need to talk. Both of the conversations are also included as short cartons that you can watch. These cartoons have more visual clues to help you understand the words being used. If you need any more help to understand the vocabulary you can look at the word list on the ESL New Year vocabulary page. Situation: Jane and Andrew talk about what they will do for New Year. Jane: I can’t wait for the Christmas and New Year holiday. Andrew: I know. What are you planning to do this year? Jane: For Christmas I will stay with my parents. Then for New Year I will visit a friend who lives in Edinburgh. Andrew: That will be great. I’ve always wanted to celebrate the New Year in Scotland. Jane: They call it Hogmanay in Scotland, and it should be great fun. Andrew: Will you go to a party? Jane: We will go to Princes Street. It is the main road in the city center. They have a massive party. Andrew: What about all the cars on the road? Jane: There isn’t any space for cars. Anyway, the road is closed so all the people fill the street from side to side. Andrew: What will you do at the party? Jane: Just have fun. Go into some pubs for some drinks and look at all the entertainment. Andrew: It sound like good fun. Jane: Yes it will be. Then the best bit is singing Auld Lang Syne at the stroke of midnight. Situation: Bob and Tui talk about the New Year in Thailand. Bob: Do you like to celebrate the New Year in Thailand? Tui: Yes we like to celebrate both of the new years. Tui: We celebrate the new year twice in Thailand. Bob: Wow. Why do you do that? Tui: The first time is for the 1st of January like in lots of other places in the world. We have public holidays and go to visit our families. Bob: Ok, that is like in the UK. Tui: Then the second one is in April and is the old traditional new year. Bob: Isn’t April when you have a big water festival in Thailand? Tui: Yes. They’re the same thing. It is called Songkran and is also known as a water festival. Bob: I have seen pictures of that. It looks like a lot of fun. Tui: Yes. It is a bigger holiday than the 1st of January. Everyone goes to their home towns and meet their friends for big water fights for two or three days. Bob: That sounds as if it is a lot of fun. Tui: Yes it defiantly is. Now that you have looked at and understood the examples ESL New Year conversations from above, you can try to do the following three tasks. The more time you spend on these, the more you will learn from them. So really work hard and you will be able to get better at using English. 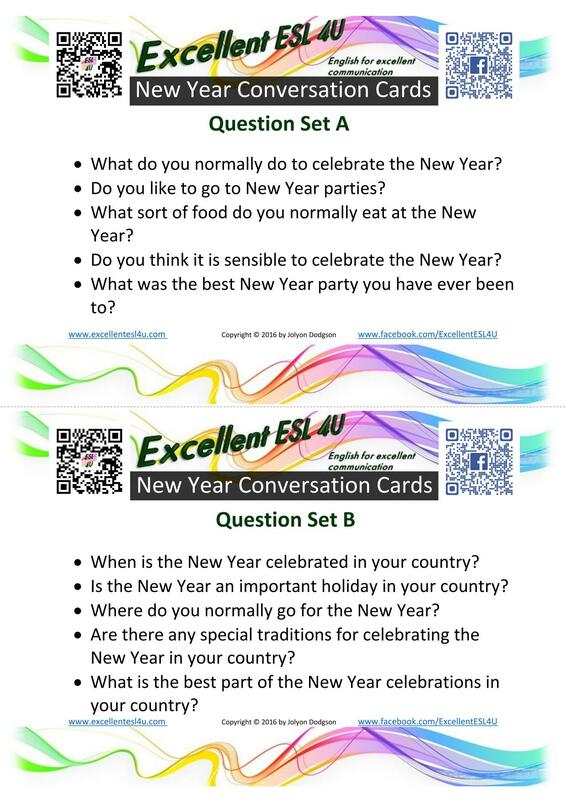 In this ESL New Year conversation activity you need to read the following conversation and then decide which option (A-D) in each question is the best to fill in the gaps. When you have finished you can use the get score button to show how many you got correct and what the answers should be. Situation: Jane asks Andrew about his plans for the New Year. Jane: What will you do for the New Year? Andrew: I will go home and __________(1)__________. Jane: It will be nice for you to spend some time with them. Andrew: Yes it will. We normally stay in the house and celebrate together. Andrew: My mother usually cooks a nice meal for us to eat. It is normally steaks. Jane: Does she do all the cooking by herself? Andrew: She does most of it. I help a bit. Jane: What do you do after eating. Andrew: __________(3)__________ and then often watch some television while having some drinks. Andrew: We also might sit and talk when the television program gets boring. Then once it’s midnight we wish each other happy New Year. Andrew: Yes, most years are similar. It’s not a big party, __________(5)__________. Jane: I hope you enjoy yourself again this year. Choose the best option (A-D) in the following five questions to fill in the blanks in the New Year conversation given above. Now, in this ESL New Year conversation exercise, you need to write a conversation of your own. You can use the conversations above as examples. You need to decide who the people will be that are talking and then what they will discuss. The topic should be about the New Year. You then need to write what they would say to each other. Try to use as much of the New Year vocabulary as possible. Then when you have finished you should find some friends and act out the conversation to get practice saying the words. For the final ESL New Year conversation task you need to have a conversation with a friend. There are two sets of questions below that you can use. Each person should take one of the conversation cards while the other person has the other one. Then you take it in turns to ask each other questions. If you can think of other questions to ask you can also include those. When you have finished you can swap the question cards so you can practice answering all of them. If you liked these question cards you can get more by downloading my ebook – 80 ESL Conversation Cards. What do you normally do to celebrate the New Year? Do you like to go to New Year parties? What sort of food do you normally eat at the New Year? Do you think it is sensible to celebrate the New Year? What was the best New Year party you have ever been to? When is the New Year celebrated in your country? Is the New Year an important holiday in your country? Where do you normally go for the New Year? Are there any special traditions for celebrating the New Year in your country? What is the best part of the New Year celebrations in your country?